No piece of sporting equipment is more personal than a baseball glove. Someone asks to borrow your football for Sunday's playground mud bowl? No problem. Mind if I take a swing with that bat? Help yourself. But from the first time you pounded a new glove with your fist, trying to beat the leather into softness—and into shape—that glove slowly became your glove. But the way to speed up personalization is to buy custom. 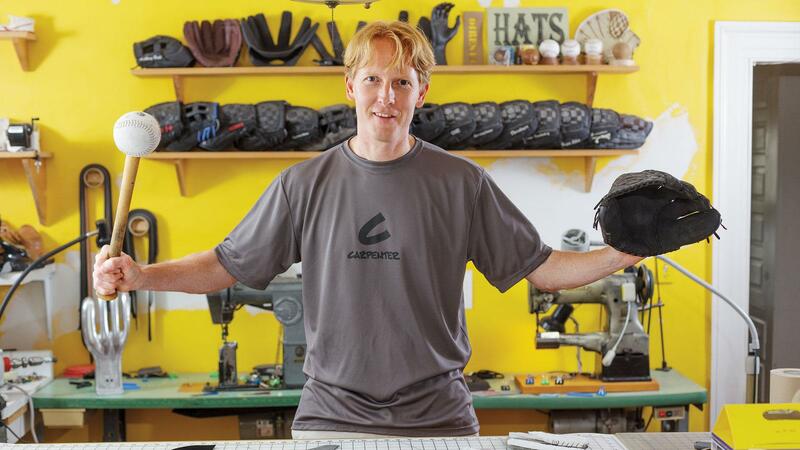 Scott Carpenter, of Carpenter Trade LLC, located near the Baseball Hall of Fame in Cooperstown, New York, makes custom gloves—based on six hand measurements—for people the world over. Models include fielding gloves and catcher's mitts ($499), extra-wide knuckleball-catching mitts ($549) and ambidextrous gloves (symmetrical with six fingers, $599). Starting with custom sneakers in 1999, Carpenter decided to apply his skills to baseball and moved to Cooperstown to study gloves. "There's no better resource to study the evolution of gloves than the Hall of Fame." He says no steadfast rules define the best glove. "It ultimately comes down to personal preference for many players. In my opinion, you want the lightest—and widest—glove possible that is still strong enough to do the job. A lot of defense comes down to how fast your glove is. When you get a bad hop or a line drive and you have to make a split-second reaction to it, the only feature of the glove that is going to locate the pocket of the glove in front of the ball in time, is going to be lighter and faster versus heavier and slower." For that reason, his gloves are made of microfibers, which weigh on average 5 to 8 ounces less than the usual steer hide models. Carpenter says the word "custom" is sometimes loosely used to describe mass-market gloves personalized for baseball stars. "Major leaguers do get small bits that are customized," Carpenter says. "They may get their name on the glove. Other touches might include the color of a web." So red, blue, green, gray—and multiple shades of brown—are now commonplace. "Otherwise it's the standard model made with dies, identical to those you buy in the store." By contrast, Carpenter takes glove orders through the Internet. "People measure their hands at home and enter that data through one of our order forms," he says. "I start with that information to make a custom glove." And even though he pays no endorsement fees for players to wear his gloves, some 30 professional players wear the Carpenter model.